Schisandra fruits (Schisandra chinensis) are among the most important tonics of Chinese herbal traditions, being one of the most well-researched of adaptogens featured in numerous Chinese longevity tonics. As a tonic, schisandra is used by professional athletes and given to thoroughbred race horses to enhance physical performance. In more recent decades, it has been researched for its ability to support liver health, being demonstrated to effectively lower elevated liver enzymes. Although there are 38 species of schisandra in China, there are two primary species in trade, those grown in the north (bei wu we zi; S. chinensis) and those grown in the south (nan wu wei zi; S. sphenanthera). 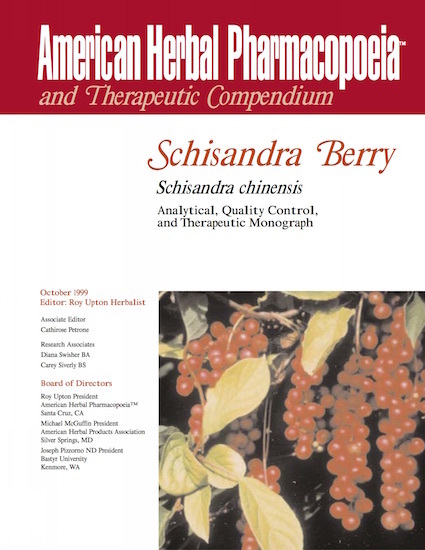 The majority of research is on northern S. chinensis, and while the species do have some actions in common as tonics and adaptogens, S. chinensis is the only species for which efficacy has been documented. The two species can be distinguished by identifying specific compounds that are unique to each species, which is addressed in the AHP monograph.